Available in two different size configurations (1/3 and 1/2HP), the high-performance lineup of Blue Angel submersible dual sump pump systems includes a powerful submersible battery D/C backup pump that can buy precious time until power can be restored. The effective combo systems are designed for quiet, efficient, and reliable removal of water under normal conditions or during an electrical outage. The innovative top suction design extends the pump life as it helps to better filter debris by eliminating airlocks while minimizing clogging from debris in the bottom of the sump pit. Featuring a durable centrifugal impeller for maximum water flow, they feature a 1 1/2" NPT discharge for easy installation and compliance with building codes. Designed with a robust cast iron pump housing and base, combos are ideal for use in 14" diameter or larger sump basins. Flow rate for each pump: 1/3HP = Max flow 77 GPM: 51 GPM @ 10'; 1/2HP = Max Flow 85 GPM: 64 GPM @ 10'' 12 volt DC back-up pump provides basement and crawlspace protection with hours of pumping power when the electricity goes out. Feature an integrated mechanical float switch for unsurpassed protection. 8 ft. SJTW power cord. 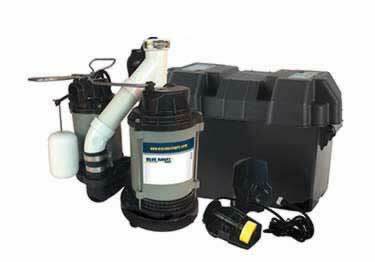 Available in two different size configurations (1/3 and 1/2HP), the high-performance lineup of Blue Angel submersible dual sump pump systems includes a powerful submersible battery D/C backup pump that can buy precious time until power can be restored.